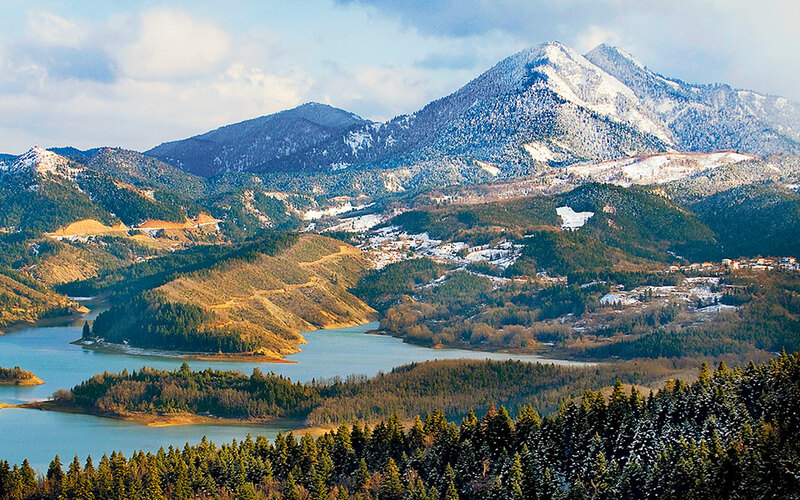 A good trip to take with kids thanks to the easy(ish) driving and many outdoor activities, a tour of Lake Plastiras will immerse you in natural beauty. Once I spent three full days around Lake Plastiras and didn’t catch a single glimpse of it. A thick fog had settled on it, and would just not go away. There have also been times when I have seen it all in white, in the absolute silence of the snow, or then again without snow, encircled by woods multi-colored and autumnal, or bare and wintry. Every season has its own particular enchantment. Driving full circuit around the lake offers you the opportunity to experience quite an exceptional route – one that only a lake can offer – since for its entire length you can enjoy views of the region’s most beautiful sight, Lake Plastiras itself, also known as Lake Tavropos. It is one of Greece’s largest manmade lakes, which was formed in 1959 as a result of the construction of a dam at the southernmost side of a plateau, on the old riverbed of the Tavropos River, in order to meet the irrigation needs of the plain of Thessaly. The drive is quite an easy one, consisting of asphalt road in its entirety and presenting large changes in elevation, as well as the expected amount of bends for a mountainous region; it has a decent road surface for the most part, except for the stretch between Morphovouni and Moni Koronis, on the eastern shore, which is in a state of disrepair and requires caution. At times the road runs right along the lake’s edge, and at others it climbs up the mountains that surround it, providing views of the lake and its fjords from high above. The villages are in general rather charming and quite developed touristically. Right by the road, covering a large area that runs alongside the lake, you can find the Zambeta Farm (tel. 24410-92855, 6945-593807), where you can go horseback riding. It is really worth devoting some extra time to Anthohori: at its entrance you will see the gorge of the same name which leads to two waterfalls and a traditional mountain bridge. If you are tempted to follow the path, you should know that it is very easy, even for children, and will take you a total of about an hour and a half, there and back. In the village itself you will find the excellent taverna Floresi (tel. 24450-41992), as well as the agrotourism guest house Montanema Handmade Village (tel. 24450-45220, prices start at 130€ for a double, including breakfast). In the nearby village of Kerasia, it is worth taking the time to sit in its beautiful square surrounded by small traditional cafés (a good choice is the café Zarkadas, tel. 24410-92139). A little further away, in the village of Kalyvia Fylaktis, you will find the guest house Kazarma Lake Resort (tel. 24410-92290, kazarma.gr, prices start at 110€, including breakfast and access to the spa), and in the village of Fylakti the fine taverna Korkotaras (tel. 6937-320969). Make a long stopover at the village of Kalyvia Pezoulas, where the outdoor activities company Tavropos has its headquarters (tel. 24410-92552, 6977-740066, tavropos.gr). Whether traveling with children or not, you can enjoy anything from water biking to canoeing, kayaking and archery, or you can set off on a hiking or a biking trail. Finish the day with a good meal at Deipnosophistis (tel. 24410-92977) or at Fagopoti (tel. 24410-92998). 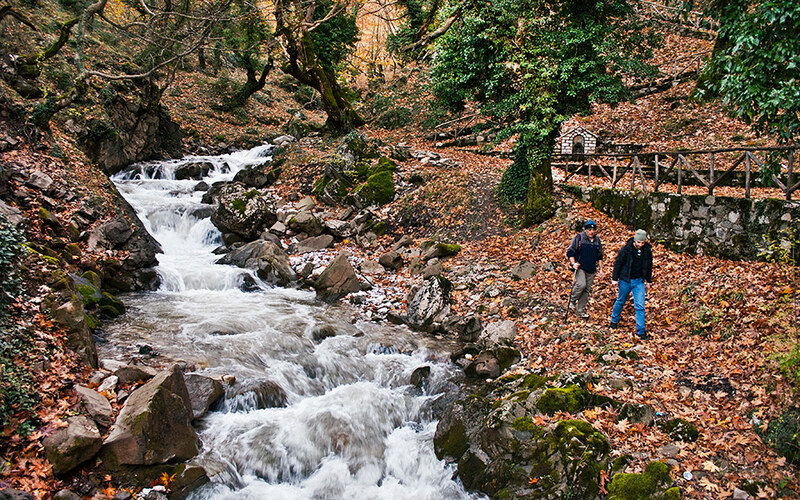 From the villages of Neohori or Belokomitis, it is worth making a detour to the Monastery of Pelekitis, and even more so to make another detour to the observatory at the point Kedros, a little before the dam (the total distance is 3km, half of which consists of a traversable dirt road, although you should be aware that the snow is not cleared on this stretch during the winter). The view of the lake, the plain and the mountains of Karditsa and Evrytania will leave you with indelible memories. Once you have crossed the dam and arrived at the eastern side of the lake, it is worth making a stop in the region of Tsardaki, for a meal at the excellent taverna of the same name (tel. 24410-20024). Finally, it may be of interest to stop at the Monastery of Koroni, and at Mesenikolas, in order to visit the winery Monsieur Nicolas (tel. 24410-70871, visits by prior arrangement for larger groups), where you can taste outstanding wines from the PDO grape variety Mesenikolas Black. The total length of the route around Lake Plastiras is 60km.